The image above, a screenshot from a recently uploaded video, appears to show a fully assembled 9K338 Igla-S (NATO reporting name: SA-24 Grinch) in the hands of rebel forces in Syria. 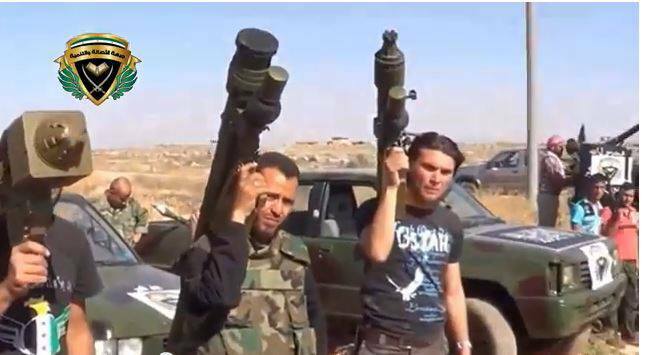 The fighters, from the Alasala Watanmia Front, exhibit four different man-portable air defence systems (MANPADS) in the video uploaded on May 30, 2013. From left to right in the video, as seen below, we see a 9K32M Strela-2M (SA-7b Grail), Chinese FN-6, 9K338 Igla-S, and 9K310 Igla-1 (SA-16 Gimlet). The three Soviet/Russian systems appear to be complete, featuring missile launch tube, gripstock, and BCU (battery coolant unit). The Chinese FN-6 appears to be lacking its BCU in the video. It is unknown, of course, whether any of the weapons shown are in functioning condition. The video was apparently shot in the Aleppo region. An earlier video, posted in February by the ‘Armoured Brigade Aleppo’ also appears to show a handful of 9K338 systems, including BCUs and gripstocks. These two videos are the only examples I have seen of complete 9K338 systems in Syria, although some previous reporting and blogging has shown incomplete systems. Western governments and reporters have expressed concern over the 9K338 system in the past, with some confusion around the presence of the missile in Libya. The 9K338 is substantially more capable than the far more common 9K32 (SA-7a) and 9K32M (SA-7b) MANPADS which are found in conflict zones throughout the world, and have been used in attacks against civilian airliners. Older systems are easily defeated by the electronic countermeasures of modern fighter aircraft, however the 9K338 poses a more significant threat to some of the slightly older combat aircraft still in use with many forces in the region. Update 11/06/2013: @Guardian_Mario has provided the image below, a panorama showing the missile systems and captured military vehicles exhibited by the Alasala Watanmia Front. My thanks to Yuri Lyamin for the heads-up on these.